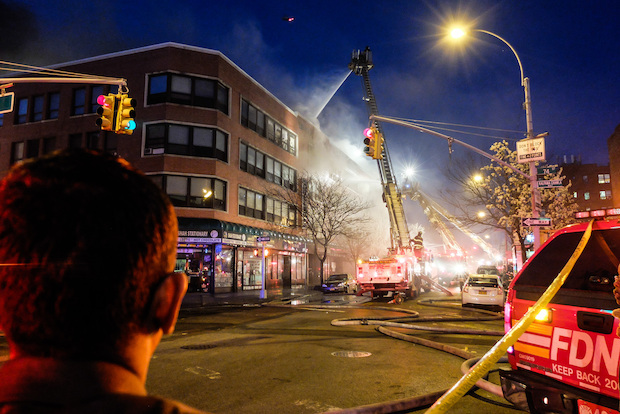 JACKSON HEIGHTS — A massive fire broke out in a Jackson Heights building that houses a college and several stores Monday evening, injuring three people, including one victim who was in serious condition from smoke inhalation, fire officials said. Flames were seen shooting out of the third- and fourth-floor windows of the Bruson Building 74-09 37th Ave., near 74th Street, after the four-alarm blaze broke out at roughly 5:45 p.m., FDNY officials said. Crews were still on the scene hours later battling the fire, even after visible flames were replaced by huge plumes of smoke. The fire was brought under control at 11:40 p.m., nearly six hours later. One person was taken to Booth Memorial Hospital in serious condition with smoke inhalation, the FDNY said. A firefighter was also treated for minor injuries and a child was taken to Elmhurst Hospital as a precaution after suffering from asthma, a source said. While it was not immediately clear what caused the fire, a source said there seemed to be a lot of combustible material inside the building, including cardboard and paper. The building houses Plaza College and several businesses, including an Argentinian steakhouse, an Italian restaurant, a stationery store and a cellphone store. It was not immediately clear where the fire originated. 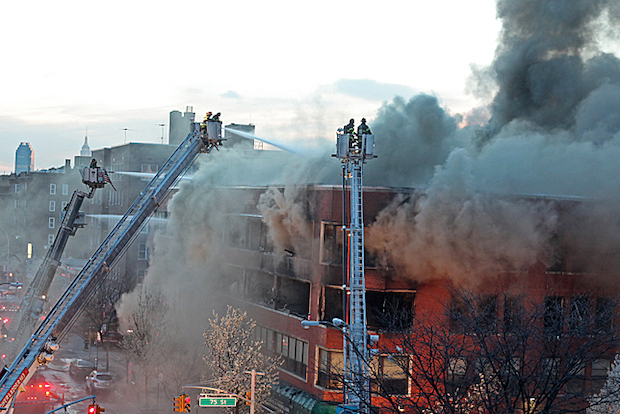 At least 39 units and 168 firefighters were at the scene to fight the flames, the FDNY said. Plaza College spokeswoman Brittany Travis said the school was on recess at the time of the fire. "All Plaza College Faculty and Staff were safely evacuated from the building," she said.